Shaun Squires scored a try and kicked three goals as Shaw Cross Sharks won an opening day fixture in the National Conference League for the first time in five years as they secured an impressive 18-12 success away to Ince Rose Bridge. Picture: Allan McKenzie. Shaw Cross Sharks made a winning start to the new National Conference League Division One season with an 18-12 victory at Ince Rose Bridge. The Sharks were trailing at half-time, but two quick-fire tries in the second half were enough to secure an impressive win. Head coach Zach Johnson admitted the team weren’t at their best but was delighted to get the win away from home. Sharks started the game well and got the first try inside 10 minutes, as Ross Roebuck shimmied and sped past a defender for the line, with the conversion from Shaun Squires putting them 6-0 up. However, Ince grew into the game and were level after Matthew Meadon managed to find a gap in the defence, with Brad Smith adding the extras. Smith then found the posts with a penalty shortly before half-time, giving the home side a two-point lead going into the break. The second half started slowly but the match turned after 50 minutes when, as Ince looked to attack the Sharks line, Squires intercepted a pass and ran the length of the field to score, before adding the conversion. Just a couple of minutes later the Sharks had another try to celebrate, as Roebuck smartly found a gap to go over for his second. A third successful Squires kick took the lead to 10 points and Sharks were in control of the game. 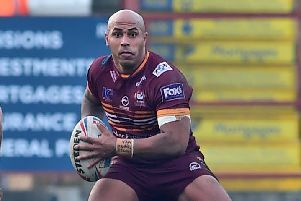 Ince’s Johnny Brown and Sharks’ Paul March were both shown yellow cards after clashes and while both sides were down to 12 the hosts pulled a try back, as Oliver Murry crossed to bring the gap down to six points. Ince threw everything at the visitors in search of another try but the Sharks defence was resolute and they managed to see out the final 15 minutes for a big opening victory. A delighted Johnson said: “I think it’s been five years since we won an opening day fixture and it’s a long time since we won one in Division One, so in terms of getting a result I’m really happy with it. “I think the skill and execution was a little off, there were too many errors and too many penalties given away, so the execution needs to tighten up if we’re to compete. “But in terms of heart, desire and fight, I couldn’t complement the lads enough. The Sharks head into Saturday’s first home game of the season against Leigh Miners Rangers in confident mood. It should provide Johnson’s men with a stern test as Miners defeated Pilkington Recs 24-8 in their opening match last weekend. Johnson added: “We’ve got a really good test in Leigh Miners but the pressure’s off us. We’re not chasing that win, we’re in a position where we’ve got the two points and we take every game as it comes. We are confident that we can improve on what we did and I know we will. n Thornhill Trojans also play their first home game in Division One as they bid to bounce back from defeat to Oulton Raiders against Milford Marlins. It will be Milford’s first game after their clash with Dudley Hill was postponed last week.